The first half of a pair of sculptures alluding to climate change and refugees has been put into place on the sea dyke in Holwerd. As of Thursday, Friesland has a new inhabitant: the Fat Lady. 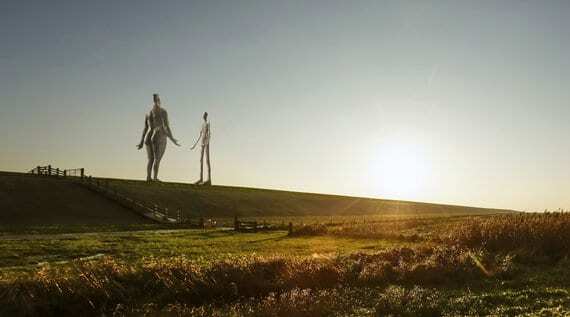 The large sculpture is half of a pair – the Skinny Lady will be moved into place in early 2019. Jan Ketelaar from Drachten is the artist behind the duo, which is collectively known as “Waiting for High Water”. The Leeuwarden Courant reports that the statues are part of a wider art project by Ketelaar called “Sense of Place” which was envisioned as part of the Leeuwarden-Friesland European Capital of Culture 2018. LF18 officially ended in late November, but a number of art projects connected to the year will still be put into place in the coming months: in addition to the Skinny Lady, the Ice Fountain (of the Eleven Fountains project) will sputter to life in February. The two statues, which can pivot to either face the water or each other, refer to both rising sea levels due to climate change and refugees whose figurative lifeboats have run aground. Researchers: "Fear of deportation seriously damages children"